final results in the PREPRODUCTION folder. Two days were spent getting ready for the second foam run for Leith. 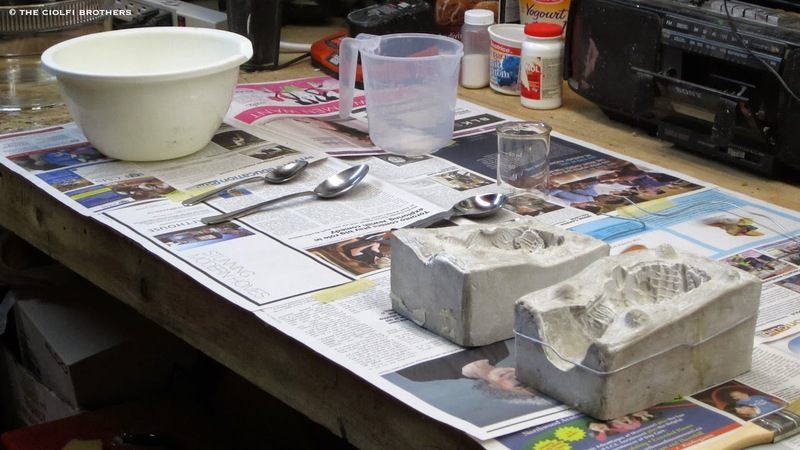 The damaged mould was glued back together using 5 minute epoxy and allowed to dry for 48 hours. I also spent 5 hours building a new armature for the puppet. I made some minor modifications to its design so that when it is place in the mould it will not disturb the foam rubber as much as the previous version did. With everything in place, I ran a 150 gram batch of foam, which is a lot more than I needed but this is the minimum amount I feel comfortable mixing. The procedure went smoothly and for the first time during this foam running marathon, the puppet emerged from the mould in excellent condition. There are no air pockets, the detail from the sculpt transferred nicely and the puppet requires only minimal patching along the seam. Leith has the most screen time in the film and having the puppet turn out this well is an enormous relief. I don't anticipate having to run any more foam for this film and will now happily move on to the painting of the puppets and the building of the sets.